SIR HENRY PARKES Signed Cabinet photograph. Cabinet photograph, 17 x 11 cms (6.75 x 4.25 inches) including mount. Photograph is by Freeman & Co Ltd of 318 George Street, Sydney with their name in gilt on the photographers mount. 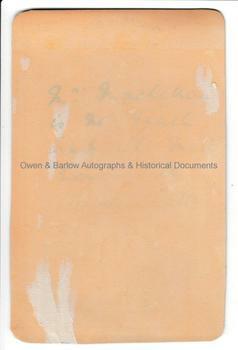 Good bold autograph signature of Henry Parkes on mount below photograph. A nice image of the rather stern looking elder statesman which, from his appearance, was probably taken circa 1890. 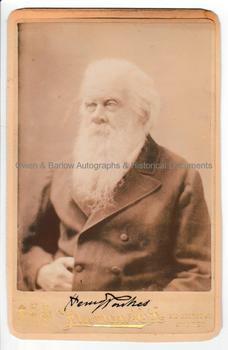 Signed photographs of Henry Parkes are somewhat scarce. Mounted on old pasteboard with slight browning to edges and mounting traces and some offsetting to verso, else in very nice condition.